is not a typo for Tin. looking for impurities in rare earth oxides. that he called holmia and thulia. and thulia was the green one. and thulia after Thule (Scandinavia). to help identify euro banknotes. It’s not the rarest rock on earth. It’s not the weirdest bird to swim or fly. I’m not the hairiest biped in the woods. I’m not the smartest primate but I try. 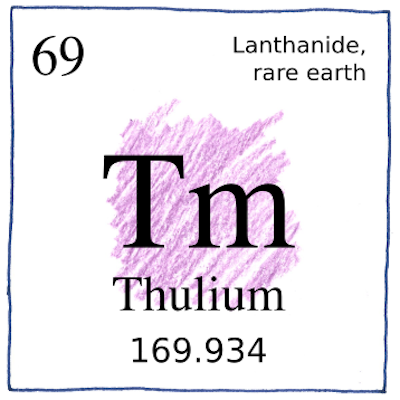 Thulium is the second rarest element, after promethium, in the lanthanide group of the periodic table. Sitting at the table, one would never say, “Please pass the thulium.” By which I mean to say that most of us go through life without using “thulium” in a sentence.